The August 2019 retreat is full. If you missed signing up and are interested, we will start a wait list and try to get you in. The retreat will be held August 19-22, 2019, once again at the Viña de Lestonnac Retreat Center in Temecula. Registration for the August retreat began at the February 5th Guild Meeting where we had a sign-up table and the retreat quickly filled up. Retreats have sold out in the past, and this one was no different. By 2/11/19, there was only one room left. As of 3/3/19, the last available room was booked. Registration for the August 2019 retreat is now closed. If anyone is interested in going that has not signed up yet, we will start a wait list and try to get you in. Contact Winter and Maja at Retreats@SanDiegoKnitters.com. Deposits are required at time of sign-up. Final payment is due by the August Guild meeting. Check should be made out to SDNCKG. For complete information regarding cost and location, see here. 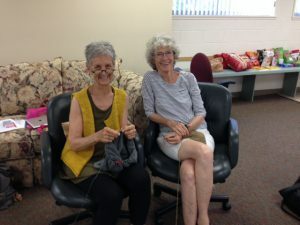 Never been to a Guild Knitters retreat? Learn more here.